Ever had the thought that your smile would be that much better if your teeth were just a little straighter? You could very well be right. Have you perhaps thought about getting braces but reconsidered at the last moment because the thought of having metal braces doesn’t appeal to you? It’s not unheard-of and totally understandable. Fremantle Dental Care offers a unique solution called Invisalign that provides teeth straightening in the form of invisible braces. Contact us today to schedule your appointment for consultation. Invisalign is an orthodontic treatment that utilises removable aligners. 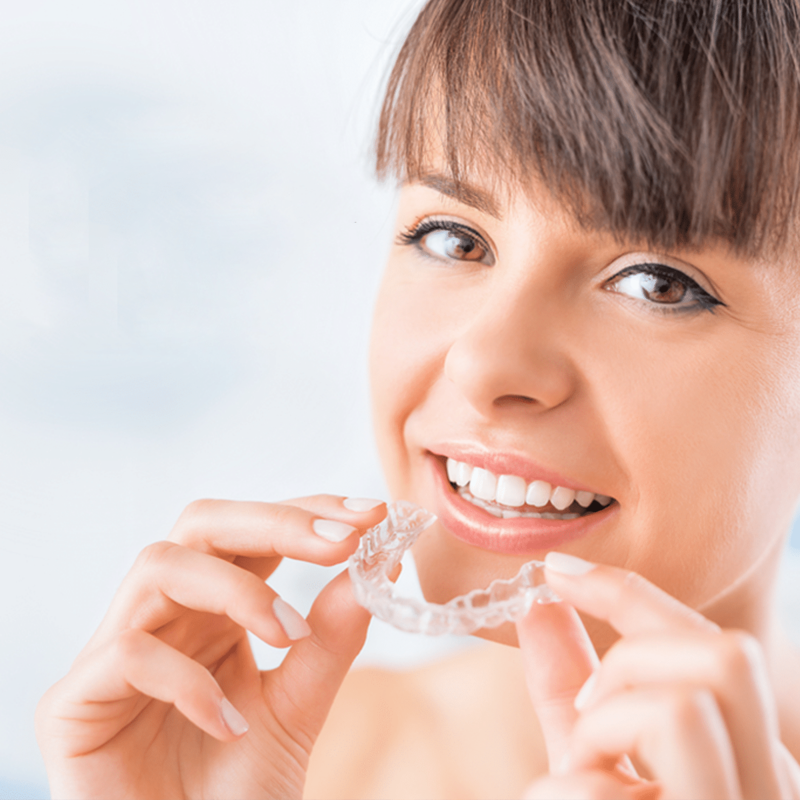 These aligners are made specifically to fit the dimensions of your mouth and teeth. As transparent braces they have proven themselves to be a compelling alternative to traditional metal braces. Like their metal counterparts, these invisible braces are designed to help straighten teeth to improve their functionality and improve the aesthetics of any smile. Their greatest appeal is that they can go unnoticed while still offering the same benefits as their predecessors and are available for adults and children alike. Your transparent braces will be replaced every two weeks as your teeth move gradually until they have reached the intended position. The qualities of Invisalign make it a favourite, as your daily life can continue without any hassle or discomfort. Furthermore, these invisible braces are removable while still managing to straighten teeth and close gaps between teeth quicker than traditional braces. We recommend that you book an appointment for consultation to ensure that the most appropriate treatment is put into action. In the event that you are a candidate for this treatment and opt to take it, our trained practitioners will take an impression of your bite or conduct a scan before sending the information to the manufacturer of your aligners. Relying on advanced, computer-generated imagery (CGI), a series of aligners will be manufactured for you. Afterwards, a virtual projection of your treatment and its consequents results will also be created. Once complete, the physical aligners will be sent to our dentist, who will then give them to you and explain in detail how best to make use of and maintain them. From initial treatment to completion, it can take up to 8 months to get the results you desire. Boost Self-esteem and Confidence – They are transparent and almost invisible ensuring that your treatment goes unnoticed. Comfort – Their size, ability to be removed, and custom-made design allow you to eat virtually anything with ease and offer superior comfort. Aesthetics – They are effective at straightening the teeth and thus improve the appearance of your smile. Convenience – Extremely easy to clean and maintain. If you are considering Invisalign braces for yourself or your child, and have more questions about this service, don’t hesitate to call us. Our friendly team of professionals will be more than happy to answer any questions you have, and help you book an appointment to take the first steps towards your new smile.